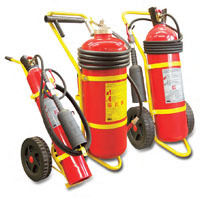 Mobile fire extinguishers are used for effective protection against a variety of industrial fire risks where the risk is large and a longer application time is required . They are for professional use in harsh environments such as petrol stations and building sites. Angus Fire’s mobile extinguishers are available in AFFF Foam, Monnex and ABC powder; and Carbon Dioxide.